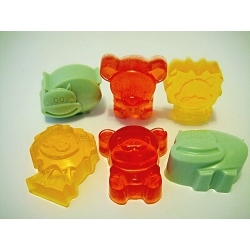 These funny animal shapes will encourage children to wash their hands more often and thoroughly promoting good health! This is a set of 6 glycerine soaps perfect for all occasions, great as guest soap, gift soap, as well as children soap and parties favor. Your soaps will arrive in a clear cello bag, tied with a satin ribbon. All soaps are scented with a clean, fun, holiday fragrance suitable for boys and girls (Bubble Gum, Cotton Candy, Banana Coconut, Mango Sorbet, Apple Spice and others).